Just returned from another aborted tuna tagging due to very rough seas. Managed to tag two large tunas (50-60kg) during night fishing. During the day, anchored on a Fish Aggregating Device (FAD) and bounced along 3-m waves. Just returned from another aborted tuna tagging due to very rough seas. Managed to tag two large tunas (50-60kg) during night fishing. 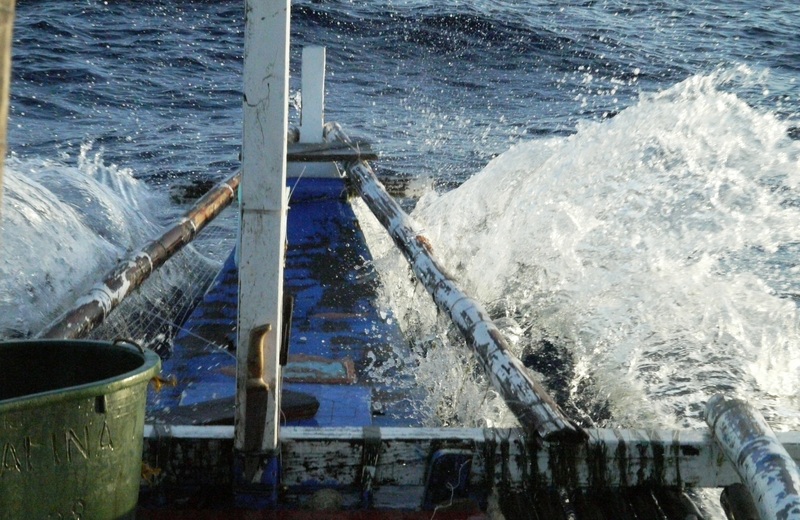 During the day, anchored on a Fish Aggregating Device (FAD) and bounced along 3 m waves. Upon return, I got an email from Michael (a consultant form the US) that a fish that we previously tagged last October 18 was recaptured with the tag still attached. I will now go back to immediately recover the tag as people are already fighting over who will get the reward. I will need to turn off the satellite tag, pay the fisher, send the tag to the US to have the data read and reprogramed so we could reuse it. This recapture fish reveals quite a few things. First, its shows how high fishing effort is in the area. Second, it reveals that popup tags are taken quite well by large tunas, which take the bait even after tagging. I was informed that the hook that remained on the mouth of the tuna when we cut the line was no longer there. I still have 11 tags to go. Every weekend, I will spend time to put the tags on the water. I am also checking the feasibility of getting fish from a set net operator, where it was reported that 30-35kg fish are caught. This will make tagging easier. Not all tunas caught are tagged, I have to assess the condition of the fish to be tagged—a lesson we learned in the Indonesian experience and choosing the right sizes and condition of fish. Off the Mindoro coast, Philippines, to tag tuna.